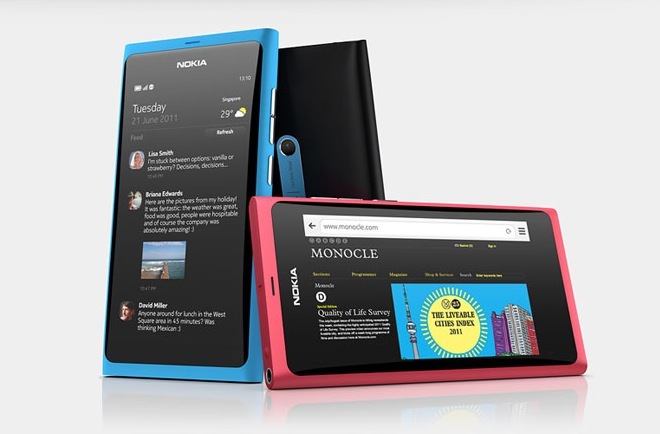 Nokia's N9 smartphone is one of few Meego-running devices. There may be another victim in the smartphone-strewn battlefield of the mobile OS wars. Intel’s Meego OS could be dropped from the ranks due to a lack of enthusiasm from smartphone and tablet manufacturers. Industry sources say Intel will instead focus on hardware and turn to Android or Windows Phone 7 as a platform for mobile devices that debut in 2012. Intel does not comment on industry speculation or rumor. We remain committed to MeeGo and open source, and will continue to work with the community to help develop and meet the needs of customers and end users. Nokia officially abandoned Meego, and its own Symbian operating system, in favor of Windows Phone 7 in February. The N9 smartphone is one of its few Meego devices, but the platform never garnered much confidence, either among handset makers or consumers. Recently, another fledgling OS, HP’s webOS, was put to rest, but recent reports show it might be revived in the TouchPad tablet a bit longer. Can smaller mobile operating systems stand a chance against big guys like Android and iOS? Even the former BlackBerry empire appears to be bowing to increasingly popular Android and Apple devices. Recent stats put Android at 39 percent of the mobile market, with iOS at 28 percent and RIM not too far behind at 20. But big innovation often springs out of the little guys. For instance, with the Meego-running Nokia N9, there’s no home button. Returning to the home screen is done with a sideways swipe from any side of the screen. Fusion Garage employed a similar technique with their Grid OS tablet and smartphone and revamped what we think of as the home screen interface. History has shown that as tech companies become bloated empires (cough Microsoft cough HP), their level of innovation doesn’t always match that of their smaller counterparts. You can blame it on bureaucracy, or perhaps employees’ lowered drive as they settle into a cushy, secure job. Relentless patent-trolling and lawsuit-filing also prohibits creativity, in the software space in particular, as corporations and patent firms try to block one another’s progress in an effort to get ahead (or at least reap some cash). Regardless, in the mobile space, apps — lots of apps — are a boon to the success of your OS. It’s a lesson both iOS and Android have taken to heart, one that makes a successful entry into the market exceedingly difficult, as webOS’s demise unfortunately shows. But at least Intel has a strong hardware business to fall back on. It could use a little more TLC if it’s going to maintain its dominance and stand out in the mobile arena. And why’s that? Apple reportedly has been considering switching to ARM processors on more of its devices, a move that would help unify the iOS/OS X computing experience, but at the expense of Intel’s business. Apple has pushed Intel to develop more efficient chips and threatened to take its business elsewhere if Intel doesn’t meet its power consumption demands. Some reports posit that Apple already has a deal to spread the ARM architecture to its laptops by 2013. If that’s true, we could see Intel go the way of HP in the next few years.